A method and apparatus for inkjet printing is provided onto fabric (15) using ultraviolet (UV) light curable ink, the ink is first partially cured with UV light (24) and then is subjected to heating to more completely cure the ink. The printing is provided in a quilting machine (10) having a quilting station (27) and a printing station (25) located upstream of the quilting station. Preferably, at the printing station, only a top layer of fabric is printed with a multi-colored design under the control of a programmed controller (35). 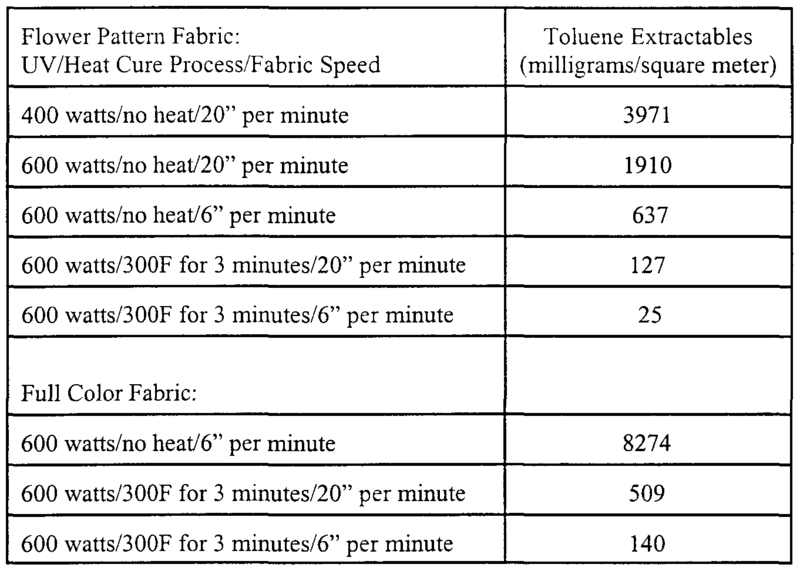 UV curable ink is jetteed onto the fabric with a dot volume of about 75 picoliters. A conveyor (20) moves the printed fabric from the printing station through a UV curing station (24) where a UV curing light head moves either with the print head or independent of the print head to expose the deposited drops of UV ink with a beam of about 300 watts per linear inch of energy, at a rate that applies about 1 joule per square centimeter. The conveyor then conveys the fabric through a heated drying station or oven (26) where the fabric is heated to about 300 degree F for about 30 seconds up to three minutes. Forced hot air is preferably used to apply the heat in the oven, but other heating methods such as infrared or other radiant heaters may be used. Before, or preferably after, the heat curing, the fabric is combined with other material layers and a quilted pattern is applied in program controlled coordination with the printed pattern. 9. The method of claim 7 wherem the heatmg step includes the step of heatmg the fabnc havmg the substantially cured UV light cured ink thereon and thereby reducmg uncured monomers of the UV curable ink on the fabric to less than 100 PPM. 31. The method of claim 30 wherein, the drymg mcludes flowing hot air onto the substrate havmg the substantially polymerized curable ink thereon. 32. The method of claim 30 wherem, the depositing of the ink is by jetting the ink from at least one print head. 35. The method of claim 30 wherein, the depositing of the mk is by jetting the ink from at least one piezo-electπc print head. 36. The method of claim 30 wherein, the depositmg of the ink includes depositing UV curable ink and the impmgmg of the energy beam includes focusing a beam of ultraviolet light onto the deposited ink. 37. The method of claim 30 wherem; the depositing of the mk includes depositing EB curable ink and the impmgmg of the energy beam mcludes focusing a beam of electrons onto the deposited ink. 38. The method of claim 30 wherein, the depositing of the mk mcludes depositmg polymenzable ink contammg no substantial amount of solvent. IT1402897B1 (en) 2010-11-24 2013-09-27 Fim Srl digital printing and finishing process for fabrics and the like.